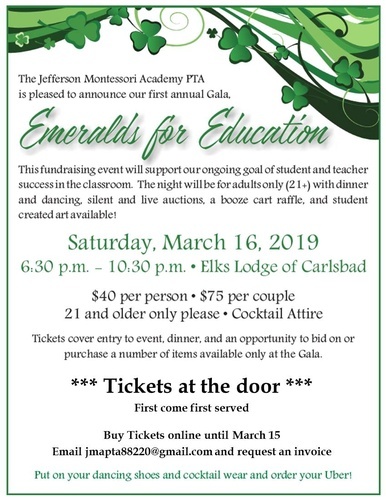 This fundraising event will support our ongoing goal of student and teacher success in the classroom. The night will be for adults only (21+) with dinner and dancing, silent and live auctions, a booze cart raffle, and student created art available! tickets cover entry to event, dinner, and an opportunity to bid on or purchase a number of items available only at the Gala. Purchase tickets online at anytime until March 15th! Email jmapta88220@gmail.com to request an invoice. *They will be selling tickets at the door, the night of Event on a first come first served. Put on your dancing shoes and cocktail wear and order your Uber!